Yonex pursues a goal of achieving sustainable and long term corporate growth by maintaining the transparency of our management activities to all of our stakeholders, including investors, customers, suppliers, local communities and employees. Furthermore, we endeavor to respond quickly and accurately to changes in our business environment. At the same time, we seek to aggressively enhance our corporate governance system, which we recognize as one of the most important functions of our management structure. 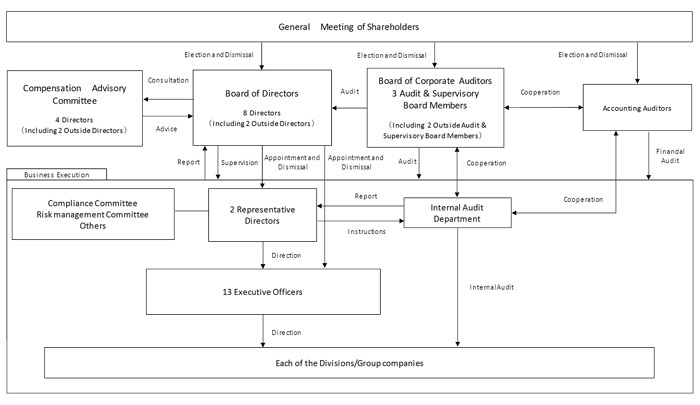 Yonex has adopted a “Company with Board of Corporate Auditors” organizational structure. Also in 2013, we introduced an Executive Officer System with the goal of promoting an efficient and prompt decision making process, and enhancing our business execution. Our Board of Directors, consisting of 8 directors including 2 independent outside directors, passes judgment on basic matters in the execution of our business. Furthermore, directors report on important management matters to the Board of Directors in compliance with internal regulations. Our Audit & Supervisory Board consists of 3 members including 2 external auditors who conduct audits to ensure the effectiveness of our audit function from an objective and independent point of view. Our Audit & Supervisory Board members attend Board of Directors’ meetings to monitor the execution status of our business operations by our directors and executive officers. Our Internal Audit Department is under the direct supervision of our President that seeks to strengthen internal control systems and compliance structures, and maintains independence in its internal audit practices. Furthermore, “Compliance Committee”, “Risk Management Committee”, “Information Security Committee”, and “Disclosure Committee” have also been established to ensure that the proper operation of compliance and internal controls is conducted. Yonex has adopted its own Independence Standards for Outside Directors and Outside Audit & Supervisory Board members. Candidates for outside directors are selected considering their experience and relationship with our Company, and on the assumption that they can fulfill their duty as outside directors and auditors with independence from management.